It all began when, sick of the materialism and unashamed greed of the holiday season,I suggested to my 11 year old that he give, instead of receive, this Christmas. He was surprisingly receptive. Having planned a holiday trip to India, I suggested to family back there that maybe we could donate some clothes or blankets to needy children in India 'in his name' as they say. As usually happens with long distance communications, somehow this got translated into a semi-formal visit to one of the local orphanages. I had a horrible vision of us behaving like urban socialites as they make their much publicized photo-op forays to slum it out while the orphans are dressed and combed and made to sing and dance for the visitors. Unhappily, that is exactly what happened. However..
One hot winter day in Bhubaneswar, Orissa, my son and I piled into the family car and made our way on the rutted, dirt tracks of one of the many slums in the city to Grace Children's Home, a tiny orphanage situated right in the heart of the populace it serves. An encroachment on government land, the slum had roads that were largely symbolic and pitted with gravel even as neatly dressed people and children navigated garbage and stray animals to go to school and work. Started with a tiny amount of funds from the Care and Share Mission, an evangelical church in the area, the orphanage acquired its land by the simple expedient of enclosing a plot in the slum area. With tithes from churchgoers, a small chapel and adjoining store-rooms and kitchen were built. The trustees of the orphanage had a dream to support 60 children and today 42 children live on the premises. When we arrived, the kids, scrubbed and brushed, all stood up to wish us and insisted on singing us a song. Not wishing to be disrespectful, we listened and clapped and cheered at the end. Afterwards, we toured the pathetically small premises and quizzed the trustees on the finances and challenges of the NGO. For any non-profit, funds are always an issue but Grace Children's Home has a particularly precarious existence. The only source of funds is the tithes from the trustees, who are not exactly affluent. The mother organization helps out once in a while but at a burn rate of 1100 rupees( 30 dollars) a month per child, money is a huge problem. The orphanage survives on the credit extended by local shopkeepers and the occasional outside donor. I wasn't sure I could decide on whether the organization was worthy based on a single visit, so we asked if there were any immediate needs that we could help out with. Taking a deep breath, the trustee launched into a long list, and we finally decided on a couple of items rather than cash. Still, our efforts were like emptying the ocean with a teaspoon. "God will provide," is the simple philosophy of the trustees of Grace Mission and I have to admire their faith. Un-accredited, unconnected with rich sponsors, these good people just live from day to day with the belief that doing something is better than doing nothing at all. The cottages were airy, clean and beautifully decorated. There were comfortable beds, a study area and a dedicated kitchen for each cottage. The kids appeared relaxed and happy and attrition is rare, confined to the occasional tribal child who cannot deal with the rule bound life. 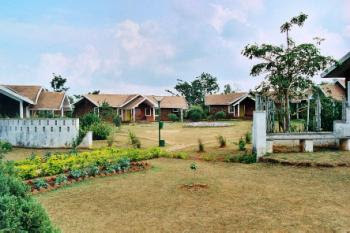 With the twin advantages of being an international organization and having a professional and disciplined approach to fund raising, it is not surprising that the state of the SOS village in Bhubaneswar is poles apart from the humble Grace Mission. The burn rate is Rs. 4500 per child( over 4 times that of the slum orphanage) but to the affluent donor, the SOS village is far more attractive, not to mention accountable and with visible results, and there is no dearth of people willing to fork out the annual fee of Rs.6000 to co-sponsor a child. Donors are sent details of the specific child they sponsor and communication with the child is possible, though it can be done only through the organization. I was tempted to whip out my checkbook right there, and only the nagging belief that my funds could be of much more use to a poorer organization stopped me. Will I donate to Grace Children's Home again? Again, the lack of transparency stops me from sending money from here in the US. Most likely, every future visit to the city will warrant a trip to the orphanage to take care of their most pressing needs in kind rather than cash. But the voices of children raised in song will continue to haunt me. This entry was posted in Good Samaritans and tagged charity in india on January 20, 2008 by vpdot. Hopefully, this Grace Children’s Home is a trust-worthy institution. For what it’s worth, I have visited this institution once and my family in Bhubaneswar continues to visit to check up on the children. The trustees seem very devoted to the cause and are personally not wealthy. I sensed it was a strong motivation from their church and their religious feeling that made them devote their lives to the cause and they are unlikely to misuse any trust reposed in them. Water, No Ice » The Bottomless Pit of Poverty – Charity in India to something more better for your subject you write. I enjoyed the post still.